Mount Everest is the realest testament to the chilling majesty of the beauty of nature. Despite the morbid and horrifying history of the world’s highest and most perilous mountain, adventurer’s from all over the world swarm to Nepal every year to peak the summit. However, not many of them return. 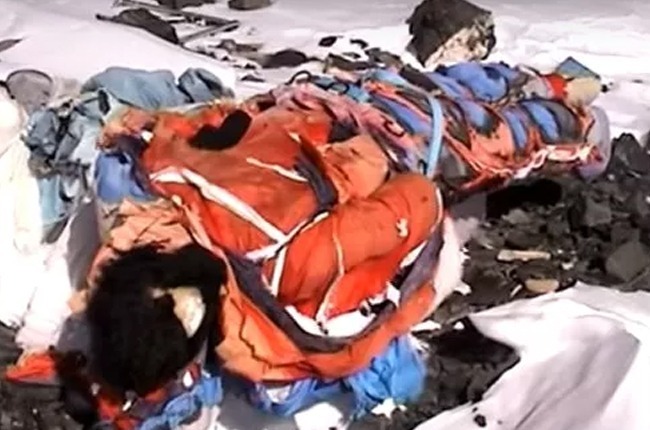 The Everest has over 250 bodies on various parts of its dangerous expanse – making the biggest open-air graveyard. The mountain comes with a “Death Zone” which is the region above 26,000 feet and it holds the most bodies. Oxygen at that level is a third of what it is at sea level causing climbers to experience fatigue, sluggishness and disorientation. Climbers’ organs undergo a huge amount of stress and they feel about ten times heavier in weight. On average, climbers have about 48 hours in the Death Zone before they perish. 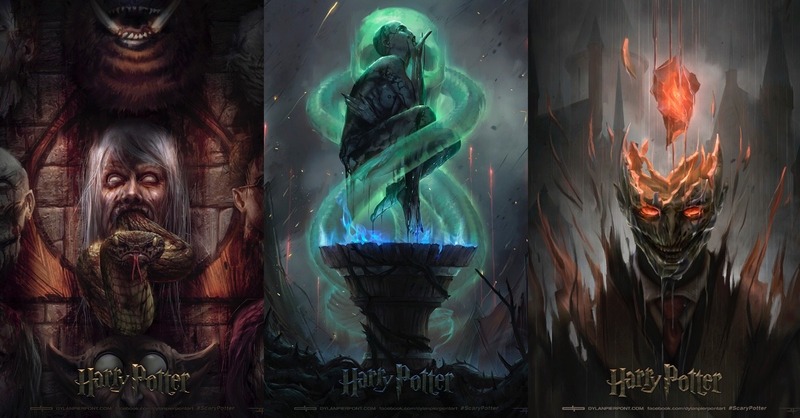 Once someone dies, it is close to impossible to retrieve their body. This is why all the bodies on Everest are still there and are perfectly preserved from the extreme cold and pressure. In October 1979, Hannelore Schmatz, a German mountaineer, successfully climbed to the summit of Everest. While climbing down, Hannelore and Ray Genet, her teammate, stopped out of exhaustion. Despite Sherpa’s pleading to climb down to Camp IV, they decided on spending the night within the Death Zone. They put out their sleeping bags without cover and slept. Eventually, Hannelore’s body was swept down to the Kangshung face by the high winds. Hannelore Schmatz was the first woman and the first German to perish on the upper slopes of Everest. In 1998, Francys Arsentiev and her husband, Sergei, were avid climbers who aimed to conquer Everest. Francys’ goal was to become the first American woman to peak Everest without making use of supplemental oxygen. She undertook two aborted attempts but succeeded in her third attempt – one that she could never celebrate. The lack of supplemental oxygen caused the couple to move slowly and summited by the end of the day on May 22nd. 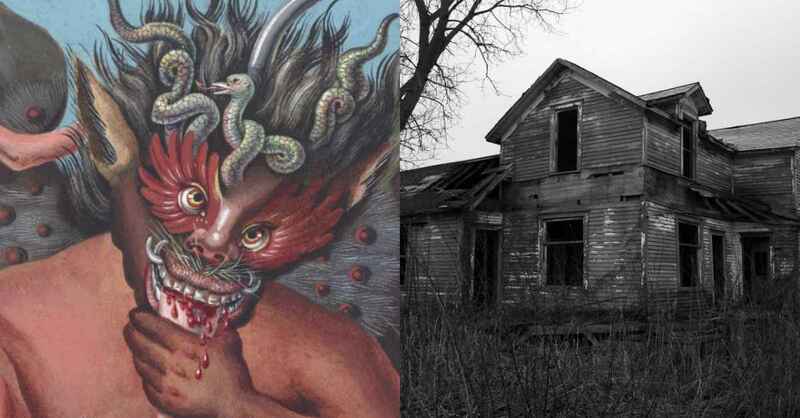 This forced them to spend the one more night in the Death Zone. In the evening, the couple were separated where Sergei went back down to Camp IV. He had assumed that his wife had followed suit. Upon realizing she was absent, Sergei rushed back up with oxygen and medications to rescue his wife. An Uzbek team claimed to have stumbled upon a half-conscious Francys and transported her as far down as their oxygen could allow. When they ran out, they headed back to camp and met Sergei along the way. He never made it back. Sleeping Beauty’s legend comes from her final hours. Climbers Ian Woodall and Cathy O’Dowd witnessed a jerking body on May 24th on the First Step (one of three steps on the northeast ridge). Frostbitten and severely oxygen deprived, Francys was still attached to her climbing line. She was murmuring, “Don’t leave me here. 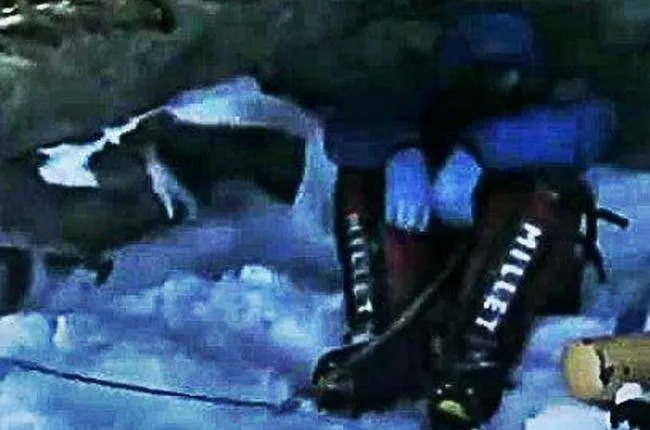 Don’t leave me here to die.” The team spent over an hour attempting to save her and even abandoned their attempt to summit. The team decided to head back to camp after realizing the lack of oxygen. Frnacys was slipping in and out of consciousness by then. Nine years later, people still used Sleeping Beauty as a marker for their climb. Woodall returned in 2007, and dropped Francys down lower where she will forever rest in peace. The North Col route to the summit of Everest allows climbers to come across the “Green Boots” landmark. The landmark is actually the dead body of a fallen climber whose nickname comes from his brightly colored boots. His identity is largely debated over but most people believe that it is the Indian climber, Tsewang Paljor. A high-class Indian expedition to summit Everest resulted in Paljor’s death and yielded only one survivor, Harbhajan Singh. When recalling the expedition, Singh stated that plenty of mistakes were made and on multiple occasions due to inclement weather changes he had urged the other three men to abandon their quest. The men did eventually reach the summit but on their trek down, they were caught up in the blizzard of 1996. The wind and snow led to zero visibility which cost Paljor and his two comrades their lives. Over time, Paljor simply became Green Boots. Many climbers have used him to gauge their distance from the top of the mountain. In 2014, Green Boots was dropped down to a lower location by the side of the mountain. There he joined other fallen climbers who were cleared off from the main route. One of the most expert of climbers of the early 20th century, George Mallory was part of the first three British expeditions to the summit of Everest. 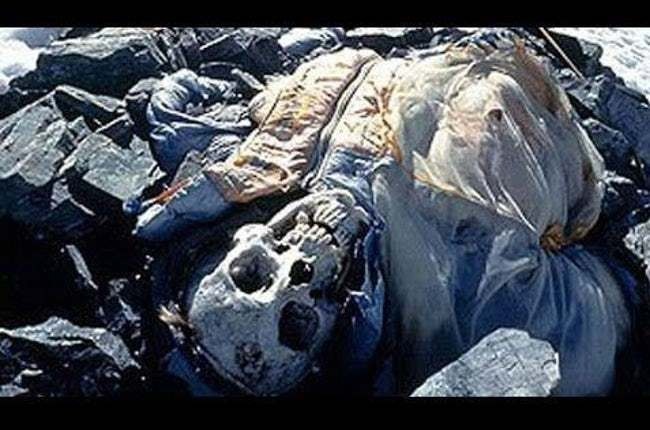 He is also distinctly known for being the oldest corpse on the mountain – one that was missing for over 75 years. On his third attempt to summit, Mallory and Sandy Irvine, his partner, pushed to the top and were never seen after. 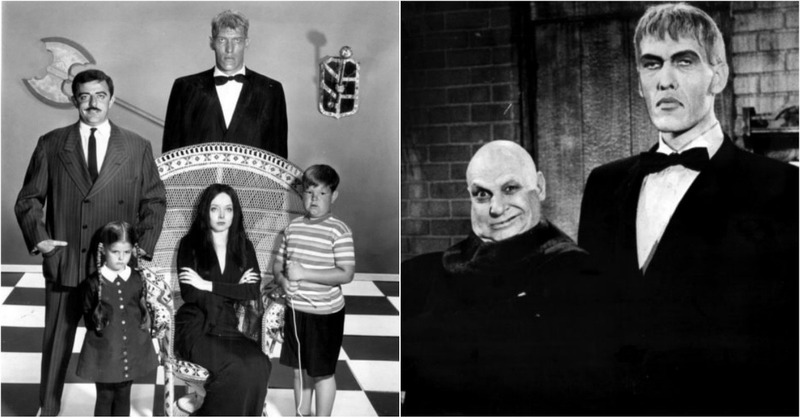 For more than half a century their death was a mystery. 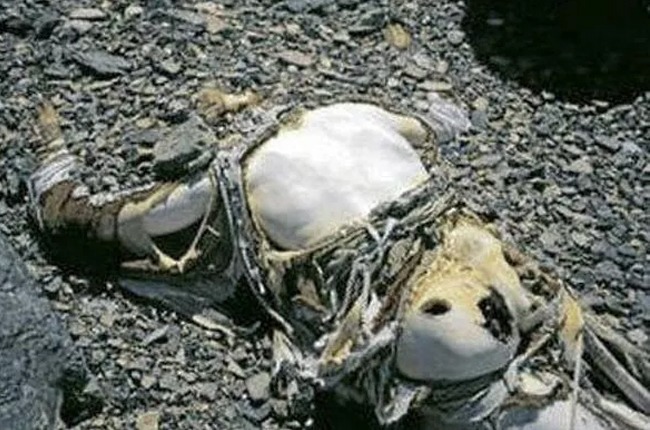 In 1999, an investigative expedition set off to find him and his body was found, mummified and sun-bleached, on the north side of the mountain on a low face. His torso had severe rope jerk injuries. This led to the theory that he was still tied to Irvine and one man pulled the other down after falling off the mountain. A puncture wound to his head the size of a golf ball led to the belief that he got caught on a tilted slab while desperately trying to halt his fall. Whether he actually summited can only be surmised. The picture that he stated he would leave at the top if he summited has not been found neither has the camera that Irvine had brought along. Kodak experts are confident that the film can still be developed if the camera is discovered. 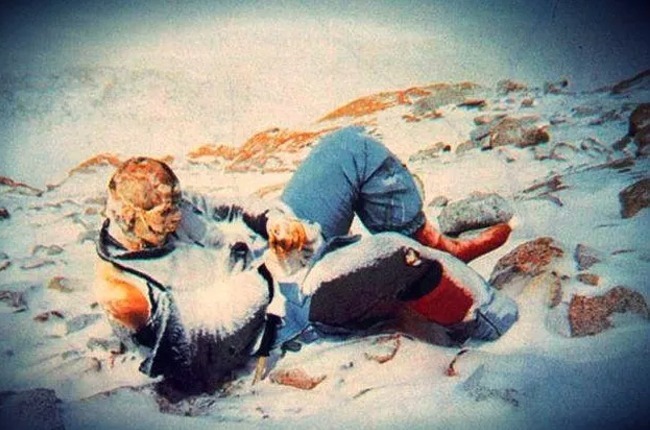 Irvine’s body was never found neither was his camera – the only possible proof of the first ever Everest summit. In 2006, David Sharp’s (an experience climber) death tore apart the climbing community raising questions about the “Code Of The Mountain.” The British mountaineer was conducting his third trek to the summit of Everest without using supplemental oxygen, teammates, Sherpas or radios. He aborted the first two attempts due to the perilous conditions and frostbite that claimed several of his toes. On his third attempt, he successfully peaked and while climbing down he stopped to rest within Green Boots’s cave. Exhausted and disoriented, Sharp curled up and fell asleep. He was never to awake. Sadly, David Sharp did not die instantly. He was passed by more than 40 different climbers who could all note his distress in his final hours. This caused immense outrage in the climbing community all over the world knowing Sharp was left to suffer and not offered help. 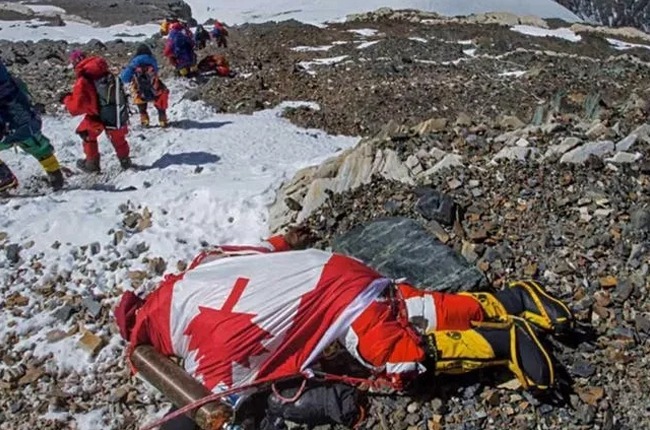 “The whole attitude toward climbing Mount Everest has become rather horrifying,” said Sir Edmund Hillary against Mark Inglis and his team who allegedly witness Sharp’s distress during their mount to the top. “A human life is far more important than just getting to the top of a mountain.” Climbers share an unwritten code which commands them to abandon their quest if they witness a climber in peril or distress. A lot of people argue that Everest has caused a “grey area” in terms of morality stating that it is every man for himself out there. This mentality merely pushes summited Everest into more of a civil war than a quest. Inglis states that he and his team found Sharp incoherent, completely frostbitten and too far gone for saving. Some claims surfaced that some climbers attempted saving him to no avail. Others attested that they mistook Sharp for Green Boots. However, a lot of people have raised the claims that Sharp was purposefully left unattended as a result of summit fever and climber greed of others. 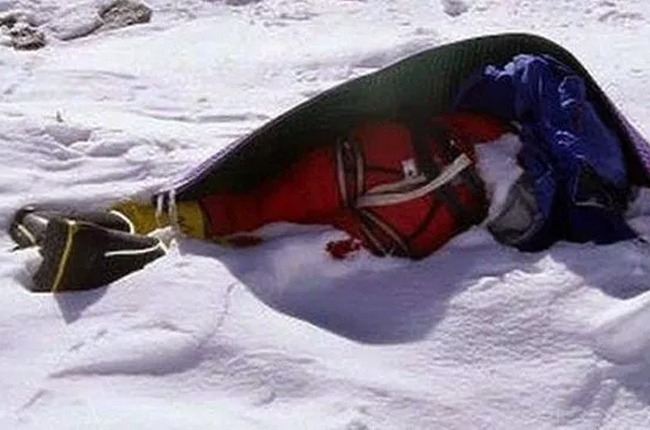 The blizzard on Everest in the Spring of 1996 took the lives of many experienced climbers. 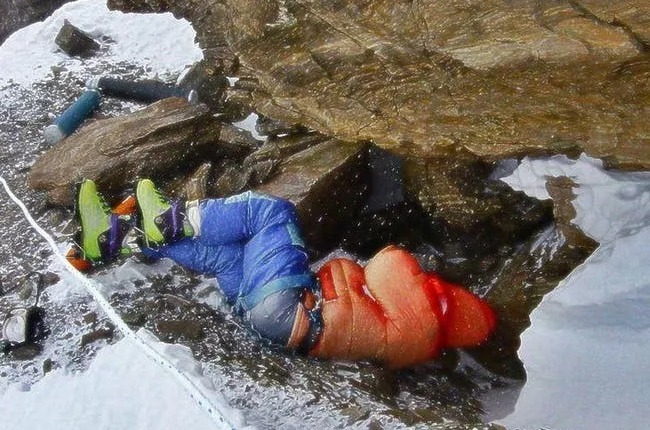 One of the many skilled climbers killed due to the blizzard was Yasuko Namba, a professional mountaineer who took to Everest to successfully conquer the Seven Summits challenge. The Japanese climber secured the title as she reached the top. She was also the oldest woman to have summited at that time. Just as she was about to descend, the blizzard struck. Multiple guides, Namba and Beck Weathers, her fellow climber, found themselves trapped on South Col. No one from the group knew what direction led to camp anymore. Namba and Weathers fell too weak to continue without complete support from guides. Barely weighing 98 pounds, Namba’s small body mass made her susceptible to hypothermia more than the others. A search party left Camp IV soon after and reached to evacuate the trapped climbers. But, they ignored Namba and Weathers as they believed they were lost causes. The next day another party was sent out and they stumbled on Namba and Weathers. By then, they were certain that they could not take the pair of them back to Camp IV. Weather crawled his way back to Camp IV after being abandoned twice over a span of 14 hours. 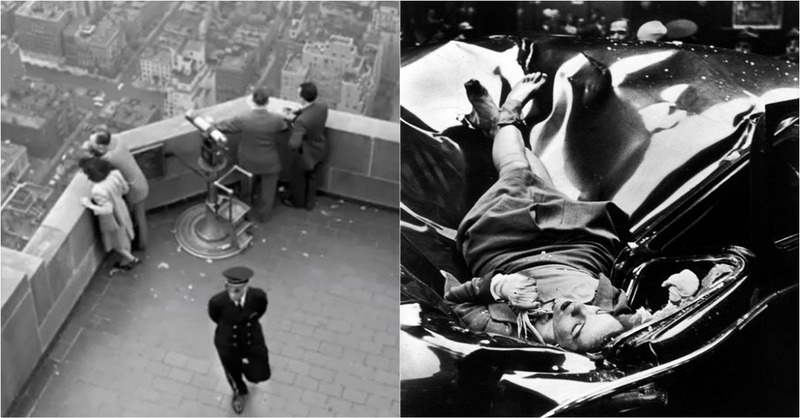 Yasuko Namba on the other hand died from exposure and exhaustion all alone. Maurice Wilson, British soldier, mystic, pilot and mountaineer, makes for the most bewildering story of death on Everest. In 1934, he decided to make use of his fierce belief in faith to solve all problems to summit Everest. He was inspired by George Mallory’s previous decade’s summit expedition. Wilson believed that the use of faith and prayer alone would cause him to succeed where Mallory had failed. 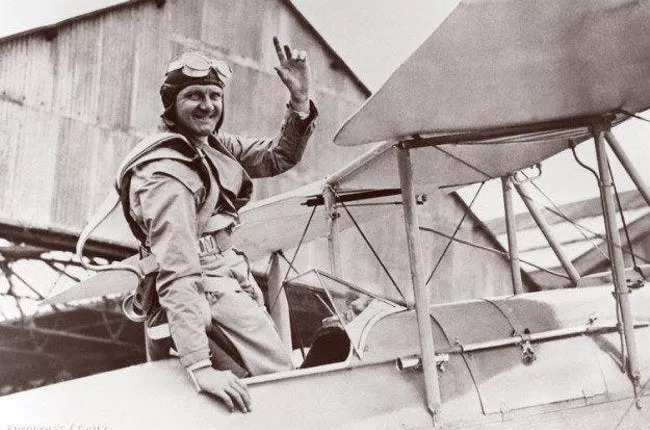 Wilson planned on using a plane to reach the upper slopes of Everest and then hiking his way up. However, he was notified by authorities that it was not allowed to fly near the perilous mountain. Wilson continued on the plan even though he was a poor pilot and all the climbing experience he had was from minor hiking on foothills around his home. He flew to India and approached the mountain from the Rombuk Glacier. He possessed to climbing equipment either and hence found himself incapable of climbing the icy mountainous walls. His inexperience was further highlighted when he came across abandoned crampons (standard ice climbing equipment) and did not collect them. He constantly lost his bearings, retraced his steps and eventually returned to the Rombuk monastery. By then he was severely exhausted, snow-blind and had a twisted ankle. 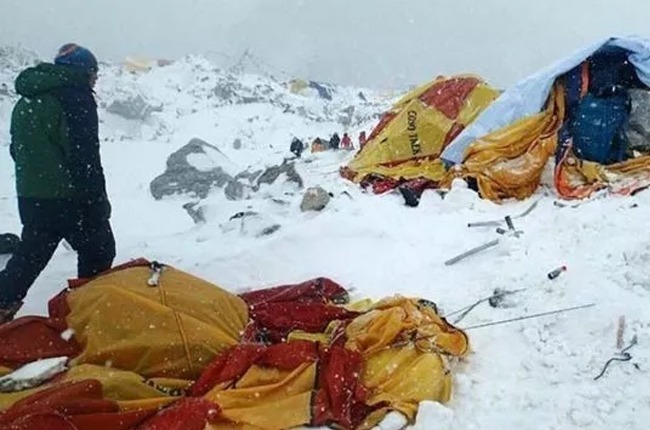 Lack of climbing equipment, repeated bad trekking experience and lack of experience led Sherpas Tewand and Rinzing to urge him to return to camp. He persisted to continue and when he did not return from his last attempt, they reported his death and left the mountain. 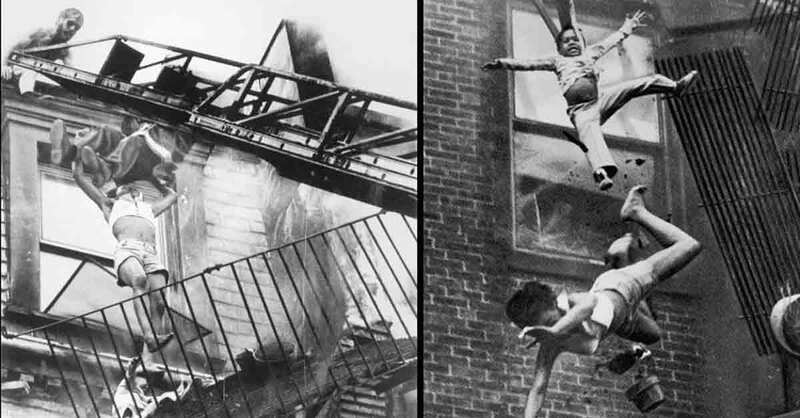 In 1935, Maurice Wilson’s body was. He was surrounded by pieces of his tent and was covered in snow. His expedition’s details were mostly collected from his diary which was found beside his corpse in a rucksack. “Rainbow Valley” lies new Everest’s summit along the Northeast Ridge Route. It is basically a mass pit of dead climbers. The name of the landmark comes from the multitude of vibrantly colored climbing gear and jackets still attached to the bodies lying on that section. The spectrum of colors is clearly visible by any who take this route. Over time, climbers have pushed more mummified corpses in the Rainbow Valley to clear the way for other climbers. The Nepalese law identifies Everest as a sacred place and all bodies need to be immediately removed immediately. However, given that it is impossible to remove bodies from the Death Zone, the bodies will remain there. The Rainbow Valley will continue accumulating more hues for its palette. A 7.8 magnitude earthquake shook Nepal in April 2015, claiming thousands of lives. The earthquake demolished multiple ancient Kathmandu buildings and caused a gigantic avalanche on Everest. Among those who died on Everest was the head of privacy for Google X, Dan Fredinburg. Fredinburg was on a quest to map and document ocean floors, remote mountains and reefs by means of Google Adventure Team exactly like Google Maps detailed town and cities. An avid mountaineer, Fredinburg had attempted Everest are scaling four of the Seven Summits of the world. The Seven Summits refers to a mountaineering challenge to successfully scale each of the highest mountains from the seven continents. Fredinburg alongside three other Google employees were on an expedition to bring Street View to Everest – from base camp to summit. The avalanche caused Fredinburg to suffer major head injuries which led to his eventual death. The other employees sustained injuries too but managed to be evacuated. Google spent $1 million on relief efforts as well as attempted to help in recovery missions by supplying updated satellite images. By means of the North Col passage in 2001, Marco Siffredi, a French snowboarder, became the first person to snowboard successfully down Mount Everest. Siffredi came from a long line of ancestral mountaineers and disappointed at his inability to achieve his actual goal of snowboarding down Hornbein Couloir – this he considered to be the true face of Mount Everest. The clouds were closing in and the day was ending. 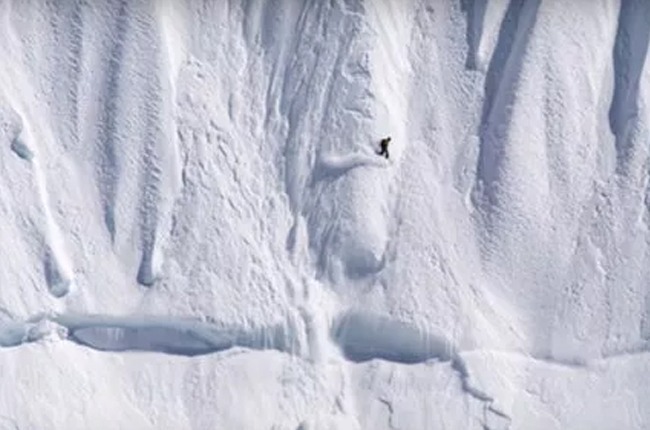 Siffredi wanted to get over and done with the descent so he could finally conquer the Holy Grail of snowboarding. 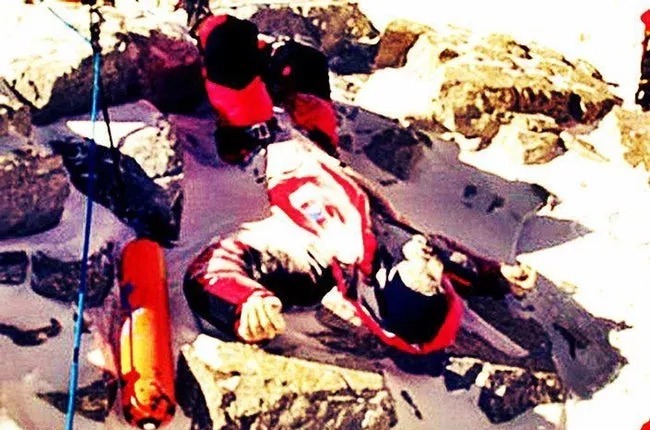 Despite Phurba’s urges to wait for the other day, Siffreddi embarked on his descent. He was never seen alive again. While packing up Camp III, the Sherpas, they saw a figure rise and slide down the North Col passage of the mountain. The figure could not have been Siffredi as he was not near the North Col. Upon investigation, the area had no snowboarding tracks whatsoever. His body was never found. Peter Kinloch had conquered four of the Seven Summits. He had just secured Everest as his fifth. 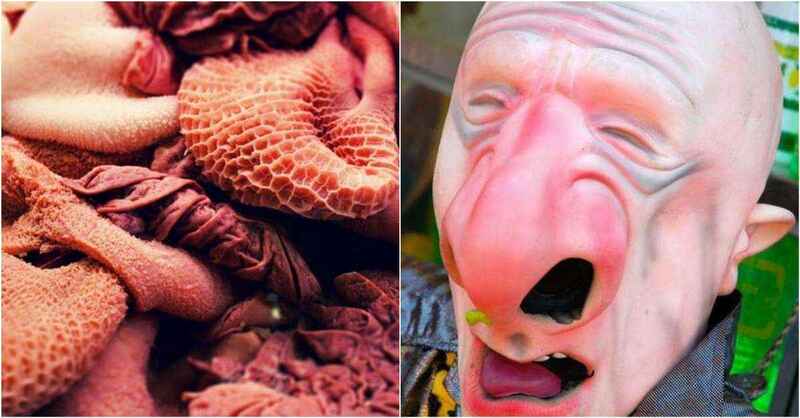 However, on his descent he experienced sudden blindness. It was odd as his team reported his peaked health and jubilance after having peaked Everest. The high altitude often causes retinal hemorrhages in climbers which is a bleeding from the cells at the back of the eye. This results in blindness and blurred vision. Kinloch’s loss of coordination was noticed by the guides after he admitted his lack of ability see. 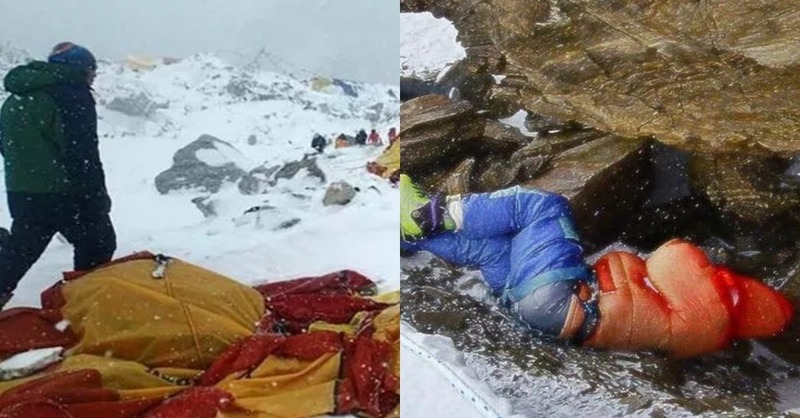 Sherpas worked hard to get the 28-year-old down. For 10 hours they alternated medicine and oxygen hoping to keep Peter stable until they reached camp. Once the team began suffering from frostbite and hypothermia, they decided to leave Kinloch behind. Months later, Rodney Hogg, Kinloch’s friend, made his own attempt to scale the mountain and found Peter’s body perfectly preserved in ice, on a ledge. “When I saw him, I instantly knew it was Peter. You could see his face. It was just like he was lying on his back taking a rest,” stated Hogg. Rodney was requested by Kinloch’s parents to retrieve his camera if he found his body. But, as the climb down to Peter’s body was too perilous, Hogg paid his respects to his fallen comrade and then continued on. The Sherpas clipped Kinloch to a fixed line on the side of the mountain when he passed away. In 1985, Karl Gordon Henize, a professor and scientist, was a NASA astronaut who served aboard the Space Shuttle Challenger. He became a senior scientist the following year, at the Johnson Space Center in the Space Science branch. Over there he often pioneered research which improved NASA study and missions. As a child, Sir Edmund Hillary (the first man to summit Everest) was one of Karl’s boyhood heroes. This caused an intense interest in mountaineering in Henize and he soon became a climbing enthusiast. Henize left Nasa in 1993 and joined an Everest expedition with a British research group. He conducted his ascent in hopes of testing a radiation NASA device at different altitudes so as to study its effects on human body tissue for long space missions. At 22,000 feet, during his second day at advanced base camp, Henize began experiencing high altitude sickness. Soon his lungs began to fill with blood plasma. Unable to descend in time, Henize passed away at 18,000 feet of pulmonary edema. He was buried above the Changste Glacier. It does not come as a surprise that the mountain is literally called “Ever Rest”. The reason behind the lack of survival teams or rescue missions, rests on the high costs (reaching an estimated cost of $25,000 or more) and perils involved. The unbearable weather conditions ultimately lead the teams to settle on letting the bodies stay on the mountain forever frozen.